As well as a shiny new stand, we are really excited to unveil a brand new bespoke range of luxury cartons at the Packaging Innovation Show at the NEC on Wednesday 1st and Thursday 2nd March 2017. 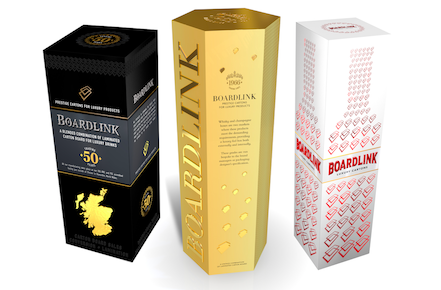 The three luxury cartons have been designed to reflect the finish achievable by our range of back to back laminated carton board, perfect for the drinks industry, in particular Champagne, Whisky and Gin markets. Our MD, Ben Still and Sales Director, Sami Kasteniemi along with the rest of the team will be presenting the finished products at the show where we will be exhibiting on stand B18. 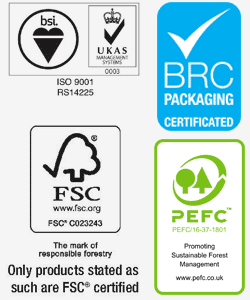 At Boardlink, we specialise in combining the highest print quality boards from the world’s leading mill. In doing so, we are able to create bespoke, two-sided rigid boards, which cannot be purchased directly from the mill, featuring challenging print and foil applications that meet the demands of the luxury goods market. The speed achieved on our machine means that for runs of five tonnes and up, we can achieve greater economies of scale for our printing partners than using their own in-house sheet to sheet laminator. The lamination process also provides increased rigidity verses the mills specification, eliminating the requirement to use a fluted product on the inside, ultimately reducing costs. We will be exhibiting with our impressive 12m2 stand, which has been designed especially for the Packaging Innovations Show.